Our hotel on the Basque Coast offers contemporary rooms, decorated with refinement and elegance. Equipped with quality services, they are equipped with television with USB connection, storage space, Simmons bedding, fluffy duvets, Nuxe welcome products, hairdryer and very high speed WIFI. Several can be arranged in Twin (twin beds). They will be the moment of privileged rest after the visit of Biarritz, Saint Jean de Luz, Sare or Espelette! Check out our competitive rates and promotional offers and book your Spa now! Each of our rooms is unique but they all combine a romantic and intimate atmosphere. The rooms deluxe are decorated in a contemporary and sophisticated style and offer the space you need. 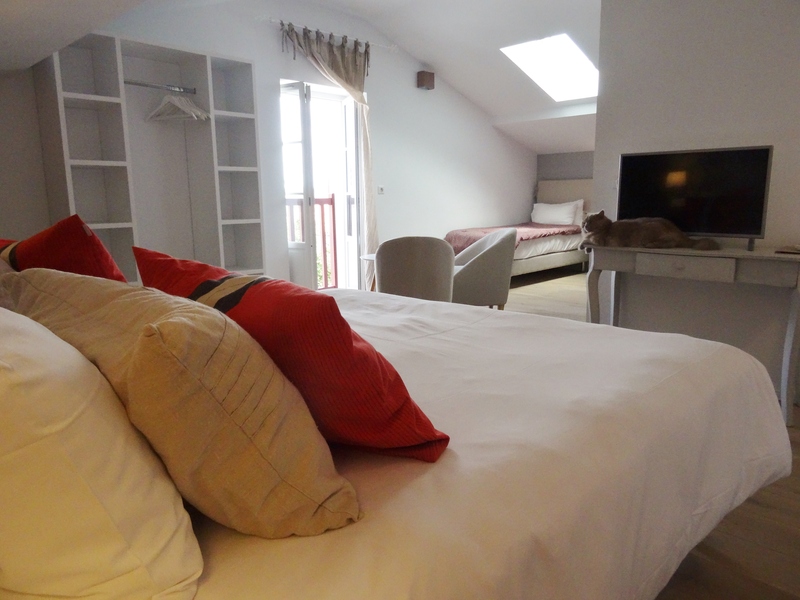 The Suites at the attic host up to 4 persons in a luxury setting, and the Suite at the “Atelier” with its shaded terrace will bring you an exceptional comfort and a tranquility.